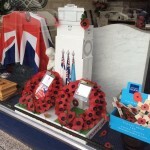 Judy Hyde, our Funeral Arranger at Northolt branch, managed to secure a replica model of the cenotaph for her window display, kindly donated by Northolt British Legion. The display invited comments from far and wide with many visitors coming into the branch to compliment us on our tribute. Judy also made poppies which she sold and raised over £200 for her local British legion.